New York Law School might be full of well, lawyers, but it’s their neighbors that are jonesing for a legal fight. The Tribeca school put its four-story Mendik Library on the market a year ago, promising prospective buyers they could build a limitless skyscraper in the low-rise neighborhood. With the demolition of the library underway and the school 30 to 60 days away from a sale, according to their selling agent, some Leonard St. neighbors are figuring out how to keep a new structure from towering above their neighborhood. Although the sleepy, low-rise neighborhood was re-zoned in 1995, capping buildings at 120 feet, the law school property at Church and Leonard Sts. was carved out of the zoning map. A developer could build a 306,000 sq. ft. residential structure on the 12,500 sq. ft. parcel, realtors for the law school said last year. Some residents estimate that could translate to a 50-story tower. Residents plan to paper the neighborhood with leaflets about the planned tower, giving out phone numbers of the law school and community board office. Convit and a group of neighbors, under the umbrella of the neighborhood organization, the Family Association of Tribeca East, also plan to begin raising funds for legal counsel. Tribeca residents have little clear information to go on. The school has been quiet about all details surrounding the sale. Alta Garcia Levat, a spokesperson for the school, referred all comments to Studley, the school’s selling agent. In turn, Studley executive managing director Howard Nottingham told Downtown Express that he was bound by a confidentiality agreement with New York Law and could not elaborate on any details of the sale. “I would love to be able to tell you everything, but I can’t tell you anything,” he said. Residents will have to wait until the buyer comes forward with his plans, which will happen “in short order,” said Nottingham, perhaps in 30 to 60 days. “People should deal with reality opposed to speculation, whatever the reality is,” he said. Not everyone in the community is convinced that mounting a campaign to influence the development is worth the effort. Several Leonard St. residents, including Wils and Convit, turned out at a recent C.B.1 meeting to plead their case. Board members were skeptical anyone could stop a developer from building a tower on property that is zoned for a tower. Developer Bruce Ratner will soon begin construction on a Frank Gehry-designed tower on Beekman and Nassau Sts. C.B. 1, under Wils’ leadership, and local elected officials negotiated a 600-seat K-8 school inside the tower and did not fight for a smaller building. In some respects, the law school tower is just one of many. Lower Manhattan is facing unprecedented development, with new residential buildings rising at a rapid fire pace—the neighborhood expects 13,000 new units of residential housing in the next five years. C.B. 1, a voluntary board with three paid staff members, is currently keeping its eye on several developments, including a proposal to rezone a swath of the North Tribeca waterfront to make way for a residential tower. “There’s so much development pressure throughout the district, there are so many sites in play. Any site that’s not built on is a potential development site,” said C.B. 1 district manager Paul Goldstein. The Law School has gotten some help from the city since it put the property on the market. Late last year, the city awarded the school $145 million in triple tax-free bonds to build a new, five-story library at 40 and 54 Leonard St. Because of the financing, the school will be able to funnel the proceeds from the sale of the Mendik library — as much as $122 million — to its endowment. So I am guessing that they are building in this whole site or part of this site. Last edited by krulltime; September 22nd, 2007 at 03:43 PM. What is he talking about? There are towers all around, including one without windows. Also, the Freedom Tower won't be far. You'd think they would have gotten used to skyscrapers with the WTC. Maybe they should worry about those parking lots on Leonard Street instead. ^ I know... they act like there is just no highrises in or right next to the neighborhood. How pathetic can they get. Maybe residents should have paid more attention when the neighborhood was rezoned. It's just ridicoulous that people in this neighborhood will lose sleep over a tower that is perfectly legal. I hope it does rise to 50 stories to give these residents a nice slap in the face.....and the pleasure of months of construction noise. Mostof the towers lie to the east towards Broadway, west at Greenwich and farther south. 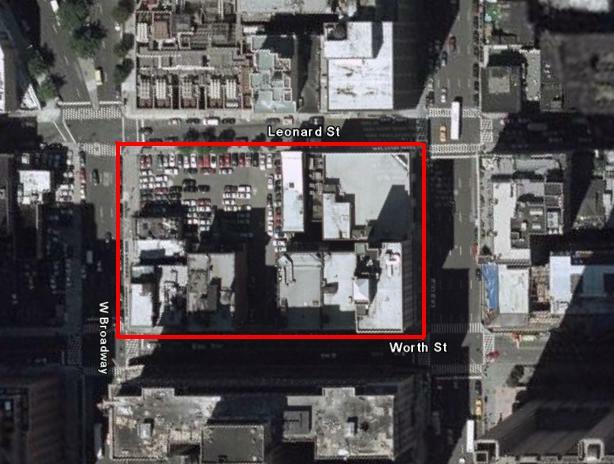 There are no 50 story towers along that area of Church St.
That short stretch of Church between Duane St. and Franklin St. was widened at some point in the past leaving "less than worthy" buildings along that stretch, hence part of the decision not to Landmark this small area: MAP (pdf). Across Church to the east of Mendik lies the Tribeca East Historic District (Blue on map below). The Tribeca West District is block and a half to the west (Yellow on map below); Tribeca South lies a block and a half to the south. Google MAP showing the location of Mendik Law School (SE corner of Leonard / Church, although the address is listed as 57 Worth St.). Would you rather look at Danny Devito every time you pass by, or Maria Sharapova? I walked by this site yesterday -- seems the biggest complaints will come from 66 Leonard, a great old condo building across Church on the SE corner of Church / Leonard. Now they have a fairly unobstructed western view (save the towers of Independence Plaza a few blocks to the west) that a new tower across the street will obliterate. C'est la vie in Manhattan. ...et cela doit etre la vie. IZAK Senbahar and Simon Elias have bought New York Law School's development site at 240 Church St., where the duo will construct a 306,155-foot luxury residential building. Among their Alexico holdings are The Mark and the Alex Hotels and the third Richard Meier building at 165 Charles St. They are also constructing a 30-story luxury tower at 402 E. 67th St. designed by Costas Kondylis. As we alerted you previously, a more complicated sales discussion with Tishman Speyer Properties never made it to the finish line as it included developing the new 216,800-foot academic building for the law school on the same block. Designed by The Smith Group, that NYLS building will include classrooms, cafeteria and a new library spread over five above-ground floors and four below. It will break ground in August. A source told us the current Mendik Library, named for the late alum and real estate great, may also not be reborn with his moniker. Howard Nottingham and Woody Heller of Studley oversaw the marketing and declined to discuss the sale. We do hear, however, that Senbahar teamed up with Goldman Sachs and Dune Capital, the investment baby of former Goldman partner Dan Neidich, in what has been relayed as an approximately $140 million deal. In a June 23, 2006 letter to the school’s Board of Trustees and Faculty, Dean Richard Matasar announced the completion of the sale of 240 Church Street describing it as a truly transformative event for the law school. The sale of the Mendik Law Library building is a critical step in “launching the school’s extensive expansion and renovation program that will provide a comfortable, attractive, warm home for every member of the law school community in a state of the art facility that will serve the school for decades. It will showcase every aspect of our program in a law building finer than any in the city,” the Dean wrote. Ground breaking for the campus project will begin next month on the first phase of the project that involves the construction of a new academic building in the school's existing parking lot. This new building is expected to be ready by the fall of 2008. The second phase of the ambitious project will consist of the complete interior renovation of the school’s remaining buildings on Worth Street that is projected to take at least 12 months to finish with an anticipated opening in spring 2010.
Financing for the new academic building comes from the sale of $135 million in insured bonds issued through the New York City Industrial Development Agency, which was successfully completed on June 30, 2006. The school’s securities were given an A3 credit rating by Moody’s and an A-minus rating by S&P, both reflective of the school’s stable market position and solid financial condition. The new building and renovation of existing facilities on Worth Street will bring together the law school’s classrooms, library, student spaces, administrative offices and professional academic centers in a combined 346,000 square foot, integrated environment that is nearly double the existing space occupied by the school today. Further details on the August ground breaking will be announced shortly. While the New York Law School gets ready to carve up some new digs, the old NYLS building at 240 Church Street, which it recently sold, will make way for "a 306,155-[square]-foot luxury residential building," according to Lois Weiss in the Post. The law school, meanwhile, is putting up a new academic building on its existing parking lot. At the reins of the 240 Church project are hoteliers Izak Senbahar and Simon Elias, who also handled the occasionally problematic third Richard Meier tower in the West Village. Precious few details on this new Tribeca development, but our money's on a Costas Kondylis design, the ubiquitous firm that (let's hear it for 'em) finally got around to snazzing up its website. Woot! These are on the Cetra Rudy website. That nimby article a few posts above is so aggravating to read. Plus the "all duplex units with an outdoor two-story space for every apartment" sounds oh-so-much better than your standard balcony. Look forward to seeing better renderings that more clearly show how this will sit on that corner plot.